JP, A seasoned & passionate trainer and coach in Agile, Scrum & SAFe with over 19 years of rich experience in software development, testing and agile coaching. Currently dedicating JP's efforts to transform software enterprises from traditional to Agile methodology. He played various roles like Coach, Quality Leader, Engineering Leader, Developer & Mentor. He is well equipped to help enterprises adapt Agile. As a coach, his focus is on Scrum process & development and test practices. He is a strong believer of engineering practices. 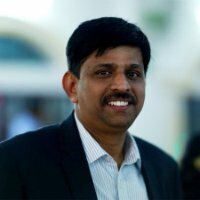 He has trained over 1000 professionals and coached 60 teams on agile. He has a customized way of implementing these practices in scrum and show a tremendous improvement in quality / predictability. He won over dozen prestigious awards. He has various certifications like CSM, CSPO, CSP, CAL & SPC on Agile space.JP is a passionate speaker at International Conferences on Agile and Testing. He has significant experience in: Agile / SAFe Consulting, Lean Start-up, Engineering practices, Product Quality, Leadership, Software Development & Testing. A few achievements as an Agile Consultant since Dec 2014.